Disclosure: I received the Kindle Fire HD7 Kids Edition at no charge for the purposes of review at the Techlicious and TravelingMom Holiday Tech and Travel Show. All opinions are very much my own. I was generously gifted a Kindle Fire HD7 Kids Edition from Amazon while at the Techlicious and TravelingMom Holiday Tech and Travel Show. You can check out all the full details on the Kindle Fire HD7 Kids Edition from Amazon here. My daughter is 2, and knows how to use my iPad mini like a boss! So, how would she take to the new Kindle Fire HD7 Kids Edition? As it turns out pretty well. First, if you’re used to iOS, there isn’t a home button. Instead, you’ll swipe from left to right on the far left side. This brings up the home icon. Swiping down from the top will show settings, and allow access to the parental controls. To activate the screen from black, push the power button on the side of the tablet. Miss V. got the hang of this within a few minutes. Let’s talk about parental controls. You can do things like set time limits on books, apps, video, and screen time as a whole. You can even create tasks like reading for 30 minutes before accessing videos. Different profiles can be setup for each of your children. You will need to connect to wifi for functionality, but it stops there. There is no browser, no Skype (unless you decide to download the app in parental controls), no email, and no way to connect to the internet at large. Also, you can expect to see no advertising in the apps, books or video. Kindle has FreeTime, which does have a monthly service fee, but before you freak out, it includes access to all kinds of kids apps, books, and Prime video. If you already have Amazon Prime, the cost is just $3 per month for one child. It’s a whole lot cheaper than paying for each app and book individually. The great news is that FreeTime is free for the first year with the purchase of the Kindle Fire Kids Edition! Amazon is also offering free replacement of the Kindle Fire Kids Edition for 2 years, no questions asked. This means your child could decide that Kindle needs a bath and Amazon will replace it for free. Amazon also built in a tremendous amount of durability, so hopefully you’ll never need to replace it. The case that comes with the Kids Edition is a high-density foam. In demonstrations, the Kindle Fire Kids Edition was thrown across the room, against the wall, and it never even blinked. We already own an iPad Mini, and it’s incredibly hard not to compare it to the Kindle Fire HD7 Kids Edition. So, how do they stack up? Let me start with the fact that the iPad Mini is mine, I got it for my birthday! But over time, it’s become filled with kids apps, and Miss V has claimed it as her own! The iPad mini has a larger screen. It’s a 7.9″ screen versus a 7″ screen on the HD7, or 6″ screen on the HD6. The iPad mini also has a slimmer profile. The Kindle Fire HD6 Kids Edition is $149, the HD7 is $189. Both come with a hefty stock case. iPad mini (original version) starts at $249, and goes up from there with newer versions. You’ll also need to purchase a kid-safe case for the iPad mini. Ours is a Griffin Survivor. Parental controls are non-existent on the iPad mini. I really like the fact that I can control how much screen time Miss V. has on the Kindle Fire, and not have to worry that she pulled it off the charger behind my back, and is playing with it in her room. The iPad mini only allows one user, so it’s all or nothing. The Kindle Fire allows a family of users each with different preferences and content. The Kindle Fire Kids Edition does not allow for outside internet access or email. Miss V. has FaceTime’d with my husband’s work contacts more than once… Ouch. There are far and away more kids apps in the iTunes Store. It’s kind of like deciding to swim in a pool versus ocean. The pool is safe, nicely organized, and you know what you’re going to get. But, you can only swim so far. The ocean has options as far as the eye can see, but every now and then you’re going to step on something sharp. For example, I want to teach my daughter about dinosaurs. I can quickly pull up pages and pages of free and paid apps in the iTunes store. Some may be better quality than others, and some may be too violent or scary for her. Puzzles, games, coloring and stories are all available. 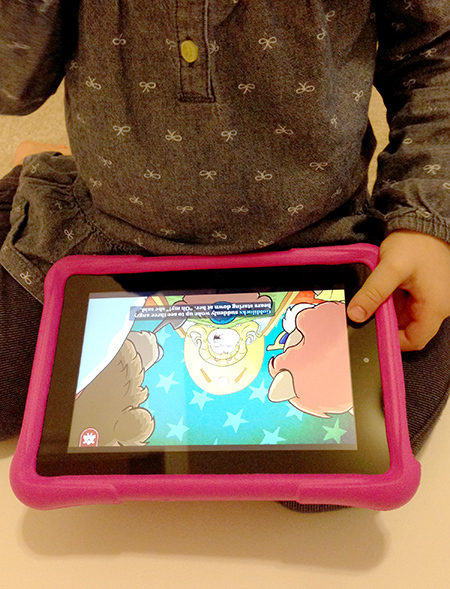 Amazon has three apps to choose from, all are stories that she can read or have read to her. If I search “dinosaurs” scores of books are available with FreeTime on the Kindle Fire. Now, the books available here do not have the option for narration for preschoolers who are not reading on their own. I’m very ok with this, because I can read the books along with Miss V. As far as iTunes is concerned, I don’t think I’ve ever purchased a book, as the price point always seems too high. Apple’s store is called i-Tunes! There is easy access on the iPad mini along with apps like Pandora and iHeartRadio, too. I haven’t figured out how to use music on the Kindle Fire Kids Edition, yet. We have Amazon Prime Video on both the iPad and Kindle Fire Kids Edition. I’m a huge fan of it on the Kindle Fire Kids Edition because only kid-appropriate videos are available to watch. On the iPad, everything is shown and Miss V has clicked on some things that were clearly not age-appropriate. However, one drawback on the Kindle Fire is the Disney Movies Anywhere App is not currently available, so we are missing some content there. 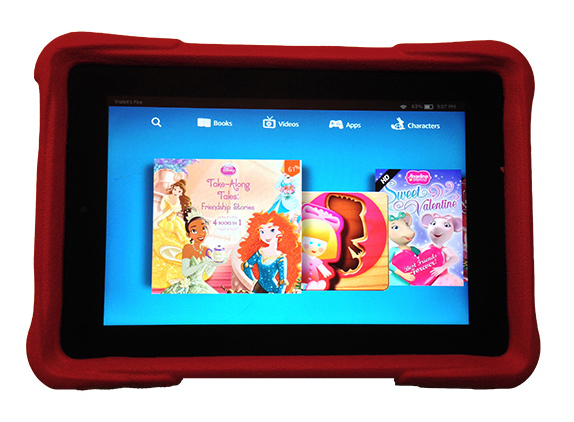 Other movies that have been purchased on Amazon can be viewed on the Kindle Fire Kids Edition. I like the Kindle Fire Kids Edition. Amazon will replace the tablet should something crazy happen for up to 2 years. I also like that only kid-appropriate content is shown, and I don’t have to worry about Miss V FaceTime’ing a family member at the most inopportune time. Also great is the unlimited nature of Amazon’s FreeTime in Prime Video, books, and apps. Plus, I can control how much screen time Miss V. can have, and when. However, The Kindle Fire Kids Edition won’t completely replace our iPad mini, because many of Miss V’s favorite apps are only available there, including Disney’s Storybook Deluxe apps, Endless Reader, and MoMA Art Lab. My sister recently asked me about tablets for her 5 year-old. I recommended the Kindle Fire. Amazon’s FreeTime is a great value considering the number of apps, videos and books included. Kids don’t necessarily need a bigger screen either. 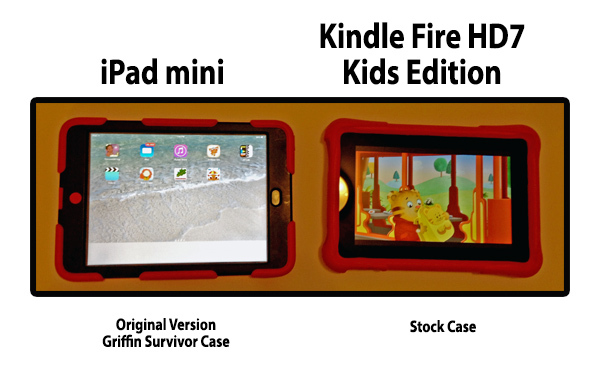 Most importantly, the Kindle Fire Kids Edition has a much lower price point than the iPad mini, and it will be replaced for up to 2 years. Because of this I’m more than willing to overlook the fact that there are fewer apps. So, as I would recommend to my sister, I would recommend to you the Kindle Fire Kids Edition. It’s best for kids 3-10, and has tremendous value when paired with Amazon’s FreeTime. It will be a member of our family for some time to come. Disclosure: I received the Kindle Fire HD7 Kids Edition at no charge for the purposes of review at the Techlicious and TravelingMom Holiday Tech and Travel Show. All opinions are my own. How are you using Amazon Prime on Fire HD Kids Edition. Kindle told me today it was not possible to run on the kid’s profile, only the adults. We setup the Kids Edition with our adult Prime ID, and then setup a kids profile. The adult ID manages usage, etc. We haven’t had a problem at all streaming Prime video. Kindle by default only shows kid-appropriate content. I hope this helps some!